Investors can choose from "nice-to-have" or "need-to-have" companies, but the latter is a stronger choice. 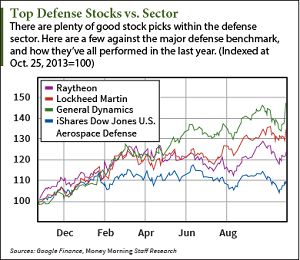 Defense stocks are a perfect example. Defense companies will not disappear. Even U.S. government budget cuts won't entirely eliminate spending. That's because, as Money Morning Chief Investment Strategist Keith Fitz-Gerald has said, "Right now there are 300 million people on the face of the earth who want to wipe out Western civilization." United States President Barack Obama has said he is committed to degrading and destroying the Islamic State. But, the current U.S.-led bombing campaign is by many measures ineffective. "USCENTCOM reports [it's] so small that it rarely totals even 25 strikes a day in both Iraq and Syria against a steadily more disperse Islamic State that can shelter in populated areas and use human shields without reservation," Anthony Cordesman, Arleigh A. Burke Chair in Strategy at the Center for Strategic and International Studies wrote in a report last week. It's clear that without a more aggressive strategy, the talks of "degrading" – much less "destroying" – Islamic militarism is all bluster. There's no shortage of good buys in the sector, although one pick is a standout right now. First, though, let's look at the sector's biggest third-quarter earnings reports. General Dynamics Corp. (NYSE: GD) had a very productive Q3. Sales were up 3.3% from last year's $4.75 billion sales figure to $4.91 billion. GD's $2.06 earnings per share (EPS) bested last year's $1.84 by 11.7%. Behind GD was the largest defense contractor Lockheed Martin Corp. (NYSE: LMT). LMT revenue fell 2.1% to $11.11 billion, but EPS grew 3.8% to $2.76. Trailing behind the two was Raytheon Co. (NYSE: RTN). Sales fell 6.3% to $5.5 billion, and EPS was down 1.9% to $1.57. You see, there are obstacles ahead that some will handle better than others. Expected federal budget cuts provide a sizable headwind for defense contractors. The Feds are a steady source of income for all of them.